Globecast provides uplink distribution for African Cup of Nations in Gabon. Paris, February 2017: From 14th January to 5th February, Globecast, ensured the successful international coverage of the 31st Total African Cup of Nations 2017 from Gabon. Globecast provided a full HD contribution and distribution service for African, European and Asian broadcasters as well as an IP platform. To cover this major event in the international football calendar, in which 16 African national teams participated, the Confederation of African Football (CAF) and Lagardère Sports (leader in the management of African marketing and audiovisual rights) enlisted Globecast for its technical and strategic know-how. More than15 major broadcasters from Europe, Africa and Asia covered the event taking the Globecast live feeds. During the tournament, many additional African channels also provided coverage depending on who was playing. 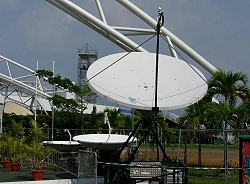 Globecast provided uplinks and contribution (primary and backup sources) by deploying two flyaway antennas (C- and Ku-band) in each of the four official tournament stadiums. To do this, Globecast managed the shipping and local logistics for nine HD satellite broadcast antenna kits representing a total of six tons of equipment. In Gabon, Globecast provided a team of engineers and a global coordinator from Globecast Reportage and its Nairobi subsidiary. In its Parisian facility (Paris-Archives/Serte), a dedicated team supervised and coordinated contribution links and international distribution for each match. Globecast also provided two commentator posts (both French) and handled the insertion of sponsors’ graphical elements to enrich the live broadcasts from its Paris MCR. In addition to broadcast distribution, Globecast also operated a video file distribution platform, which provided the rights holders with about thirty minutes of new material per day, divided into a dozen targeted sections, as well as the live streaming of the games for exclusive Lagardère Sports editorials requirements.